May | 2014 | Love Those "Hands at Home"
My cousin posted this saying on Facebook recently and it got an immediate reaction from my sister and from me. 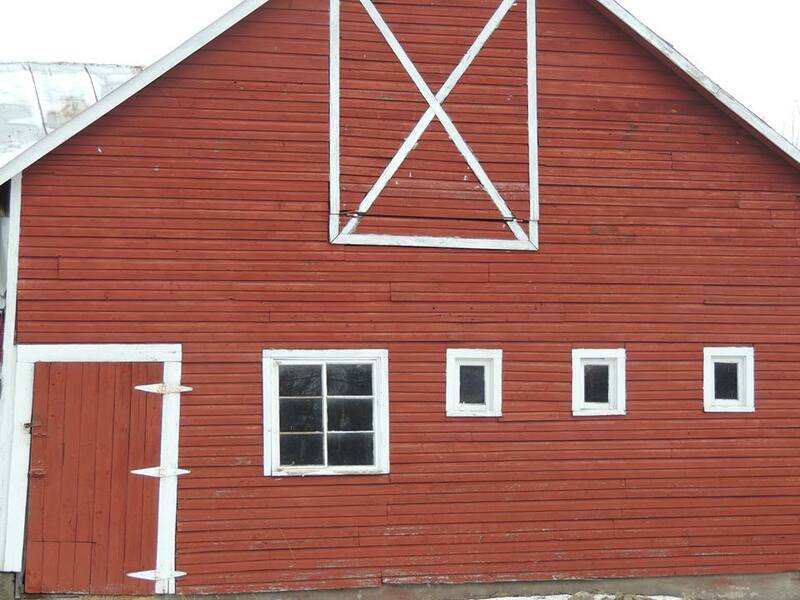 We know about barns. And farms. And memories. And a wonderful place to be a child. The farm belonged to my paternal grandparents and Sangers had been on that land since the late 1700s. 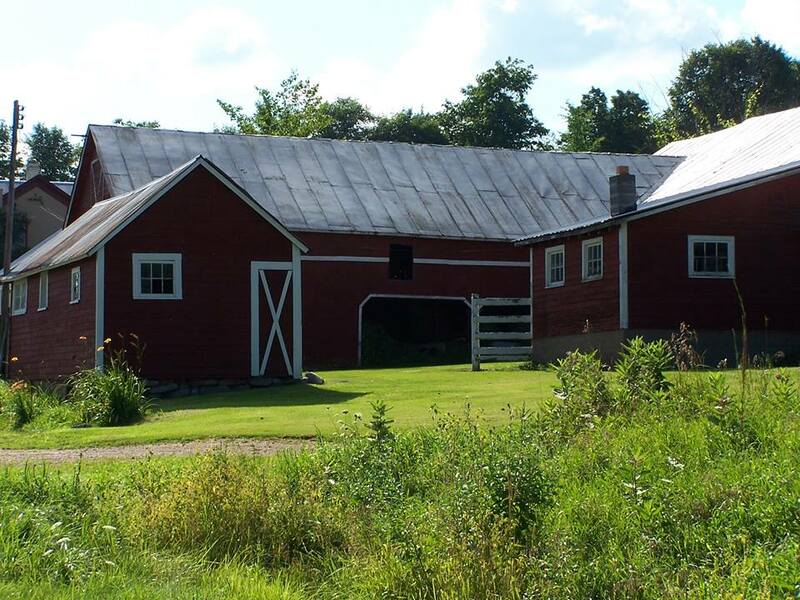 The farm was a perfect place to ramble for hours, with no supervision, and the barn seems to have been the center of our activities. I remember climbing a vertical ladder set into the wall, up into the haymow, and not being able to get down until my grandmother came from the house to help me. I remember running away from home with a bandana tied to a stick, like I had seen on TV, and running as far as the milk house before I got hungry and went to the house for a sour cream cookie. I remember swinging on a rope from one section of the haymow to another, above the head (and horns) of the bull tethered below. I remember my sister singing and dancing for the milk cows, a captive audience, whose heads were held by stanchions until the milking was done. I remember innumerable sleepovers in the haymow, with girl cousins, listening to the radio and talking about boys. I remember waking up in the early morning of one of those sleepovers. The barn cat’s kittens were at that playful age where they demanded attention. One was batting at my face. The radio was on, “Hey, Jude” was playing, and dust motes of hay swirled in the early sun. And I knew life was good. My memories aren’t momentous; they don’t make for dramatic story telling. But they make me. Maybe they have found a better way. But I miss that old farm of yesterday. And I’m not sure what I am trying to say. It’s thanks to that old farm of yesterday. 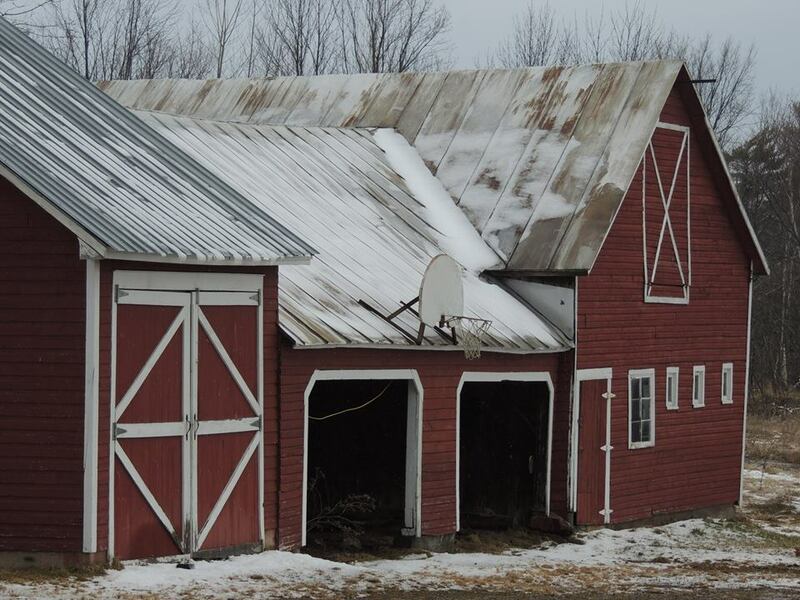 The farm is in sad shape these days–not in the family any longer, abandoned. But in my memories, and those of my sister and cousins, it’s still a magical place. Our farm of yesterday. Goodnight, Sweet Geraniums . . .
An update on my sweet geraniums–they came through the winter fine! They’ve repeated the cycle I described here–zombie white, to hot pink, to new green–and are ready for a fabulous summer! I am, too-are you? A warm and inviting city. An exhibit of quilts that should forever silence any question about whether the work of “loving hands at home” can and should be viewed as art. I spent the last few days in Boston, Massachusetts, with my husband and two friends. I could regale you for hours with stories of the fun we had but what I really want to do is show you pictures of the current exhibit at the Boston Museum of Fine Arts. 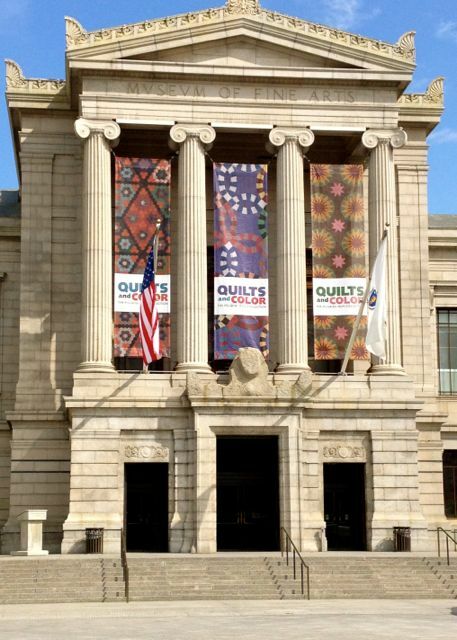 The exhibit is titled “Quilts and Color: The Pilgrim/Roy Collection” and it will be at the museum through July 27, 2014. 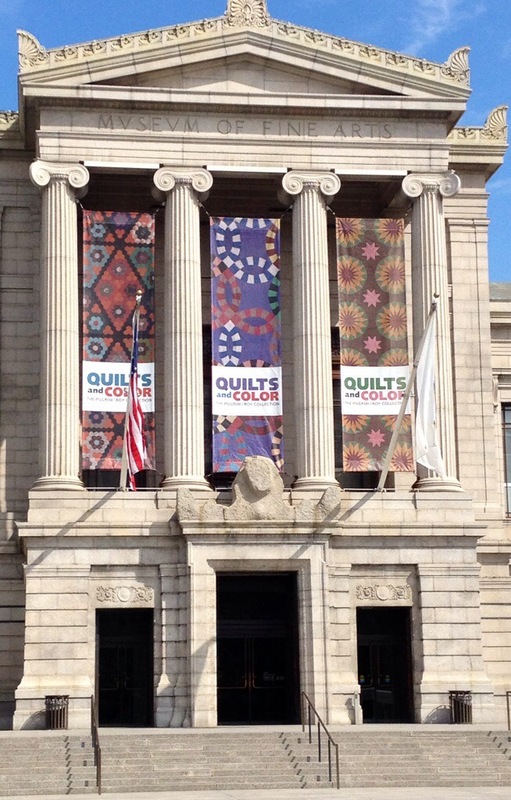 If you are able, do go to the show—it’s amazing and will give you lots to think about, regarding quilt making and the definitions of art and craft! 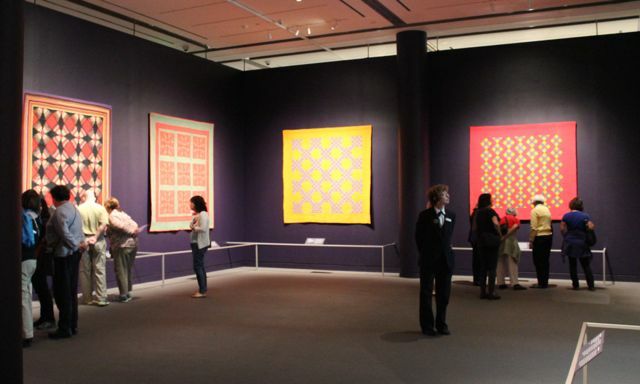 The 60 quilts in the exhibit are from the collection of Gerald Roy and the late Paul Pilgrim. Pilgrim and Roy, trained artists and interior designers, began collecting quilts for their aesthetic value in the 1960s and they amassed glorious examples. Pilgrim and Roy recognized how women had been using colors and shapes in the making of quilt designs that were every bit as innovative and exciting as the paintings of recognized artists, such as Josef Albers, and other Op Artists and Abstract Expressionists. The show is organized around different aspects of color theory. It’s all very interesting and informative but, really, I found it difficult to get into reading the explanations. I just wanted to feast my eyes on the banquet of colors and shapes and patterns. I wanted to get close to every quilt and try to imagine making stitches that tiny. I wanted to think about the women, often Amish or Mennonite, who lived what we think of as such austere lives and yet created such opulent and rich beauties. 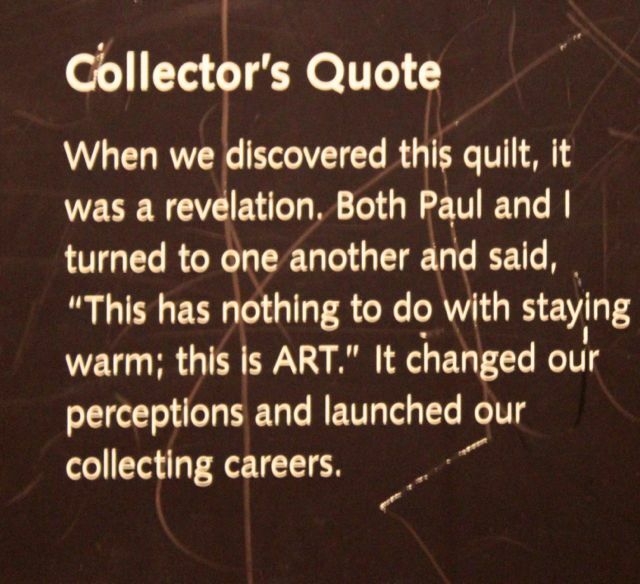 This quilt was probably my favorite of all and it was the catalyst that brought Pilgrim and Roy to re-think their notions about quilt making. The craftsmanship of these quilts is superb. Of course, they are all quilted by hand and the quilted designs combine with the colors and shapes of the fabric to create a whole that is far more than the sum of the parts. But, really, why am I still yammering on? Just look! Preview of Coming Attractions . 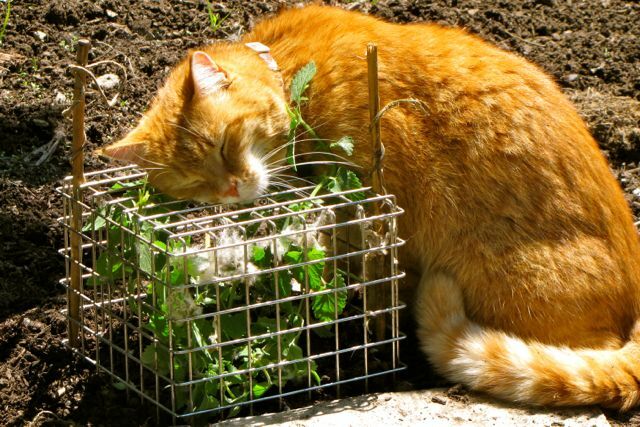 . .
We cover our catnip plants with wire baskets so the cats can’t mow them down to the ground! They enjoy the bits that grow through . . .
I’ve heard it said that quilters are often drawn to gardening, as gardeners are to quilting. Since I’ve been doing a LOT of both lately, I’ve had time to ponder this proposition and can see a million reasons why these two activities would appeal to the same people! In fact, I’m a more experienced quilter than gardener and I’ve begun to see that, when I reach a problem in thinking about my gardens, I can draw on my quilter’s knowledge to help give me insight. I bet it works the other way around, too! Here are my top five ways (out of a million) that quilting and gardening are aligned. Perhaps you can add others! Planning—While there are improvisational ways to make a quilt, I think most quilters like the planning process, which draws on both the right and left sides of the brain. There’s a fair amount of math involved in quilt making and it was only when I started making quilts that I saw any point in having taken high school geometry. Math isn’t so important in gardening but there are certainly rules to follow, in order to achieve success. I used to ignore that silly business about plants wanting full sun or shade, until the plants threatened to report me for torture. Similarly, those rules about growing zones really do provide valuable information! Level of commitment—Both quilting and gardening demand quite a high level of commitment. Even a small quilt involves multiple stages and I’ve learned it’s possible to get hung up at any stage. Quilts do not finish themselves. Along the same lines, you simply cannot have a garden without a gardener. Believe me, I’ve tried. I’ve been known to plant things and then walk away from them, and it never ends well. Both quilting and gardening are easy to start and more difficult to see through to fruition. While quilters talk about UFOs (unfinished objects), gardeners are more likely to simply look at their weedy, undistinguished patches of earth and shake their heads sadly. Patience and vision—Related to needing a fairly high level of commitment, both quilting and gardening demand real patience and the ability to envision how pieces will come together to form a whole. I suspect that folks who are exceedingly product-oriented have trouble as quilters and as gardeners. When I start a quilt, I need to be aware that it will be months before I can really see the beauty in what I’m doing. I need to find pleasure in the doing because the start is often messy and uninspiring. I need to be able to see the finished project in my mind’s eye, to give me the trust that all the tedious early work is worthwhile. It’s exactly the same with gardening. Nothing we plant really looks good at the start. I’ve spent days lately with crud under my fingernails and my flowers look small and insignificant. I tend to over-fill my perennial beds because I have trouble envisioning how big the plants will get in time. As I get slightly more experienced with both quilting and gardening, I get better at anticipating and seeing into the future, which helps me practice patience. Color and Shape—Perhaps the most obvious similarity between quilting and gardening is the use of color and shapes to create a pleasing whole. I tend to like solid fabrics (or small prints that “read” as solid) in quilts, and get results from shading and use of lights and darks. This translates well to the garden, even though I’m still trying to figure out how to do it. I like the way bright, saturated colors show up against dark backgrounds in my quilts and am trying to use bright plantings in shady areas—chartreuse foliage and hot orange and yellow flowers. I have definite preferences for color in both venues—you’ll find no purple in my quilts and the only purple in my gardens comes from one happy, healthy rhododendron that was here when we moved in and I haven’t the heart to uproot. For quilters and gardeners, colors and shapes become the building blocks of their vision. Individuality—One of the activities popular with quilt guilds is the so-called mystery quilt challenge. Quilters are told to buy, say, four fabrics in a color range of their choice. Then they are periodically given instructions of how to cut and join the fabrics. Eventually, the patterns develop and all the quilters bring their finished products together. The amazing thing about this challenge is how different and individual the quilts are, even though they are made with the same design! The different choices people make in the fabrics create limitless possibilities in the finished quilts. You would get the same individual interpretation if you asked quilters to use the exact same fabrics but to choose their own quilt patterns. 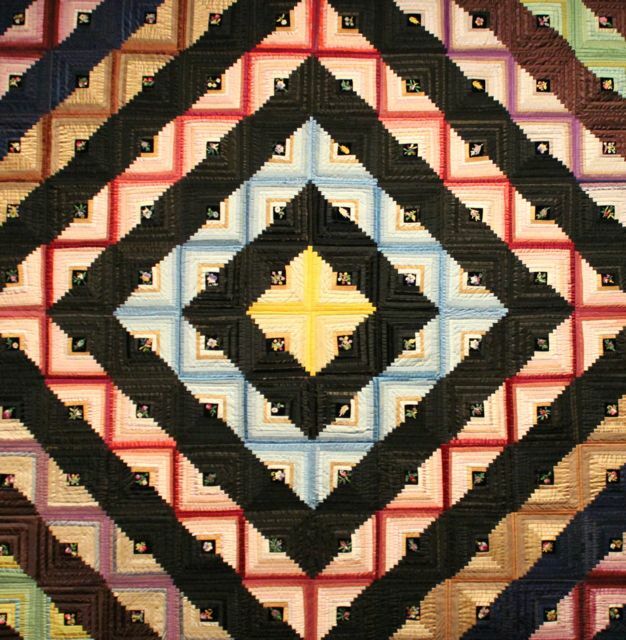 Makers have always expressed their individuality through quilt design, so much so that certain quilts can be recognized as being made by certain quilters or by having been done in a particular region. Gardening, too, offers the same endless possibilities with the same basic ingredients. We all use the same relatively small number of plants and flowers that work in our growing zone but the results are as varied as we are. If you and I both start with petunias and geraniums and creeping Jenny, my end product will look entirely different than yours! So, quilters and gardeners are always achieving their own distinctive look, even while they carefully eye the work of others to provide new ideas. Whether I’m at a quilt show or walking through a new garden, I’m wondering what I can use of the ideas in front of me. It occurs to me that the points I’m making about quilting and gardening may very well apply to other endeavors as well. Do you garden? How does it relate to your other artistic undertakings? Are there similarities? Do you learn how to approach one from the other? Do tell! As I wait to hear from you, I’m going back to my quilting. Or my gardening. Or maybe both! The quiet of morning was disrupted by the sound of big, growling engines. Motorcycles and a sheriff’s jeep, headlights cutting the misty morning, descended on the house next door. A woman in a fluffy turquoise bathrobe looked on anxiously. It sounds scary. It sounds threatening. But it brought delight and honor to the man who lives next door to us. Our neighbor is Bob and he’s an 88-year-old veteran of Word War II. Today is his big day, to go on an Honor Flight to Washington, D.C., to be feted and to visit the World War II Memorial. It is his tour of honor. The Honor Flight Network is a non-profit organization, founded in 1995 to honor America’s veterans for their service and sacrifices. Veterans are transported to Washington, with volunteers who are committed to making the trip easy and stress-free. Every detail is attended to so that these men can travel safely and feel special at every turn. At this stage, Honor Flight gives top priority to senior veterans–the surviving World War II veterans–as well as to veterans who are terminally ill. The veterans are taken to the memorial for the war in which they served. The long-term plan is to extend the honors to veterans of the Korean War and Vietnam War, as well. But today is Bob’s day! Bob enlisted in the Navy when he was 17. He saw the world, for all its good and bad, he became a man, and he was lucky enough to come home. He made a critical contribution that all Americans benefit from every day. He so deserves to be recognized and honored, and he was thrilled beyond measure for this big day. His wife, she of the fluffy turquoise bathrobe, said he hadn’t slept for two nights. 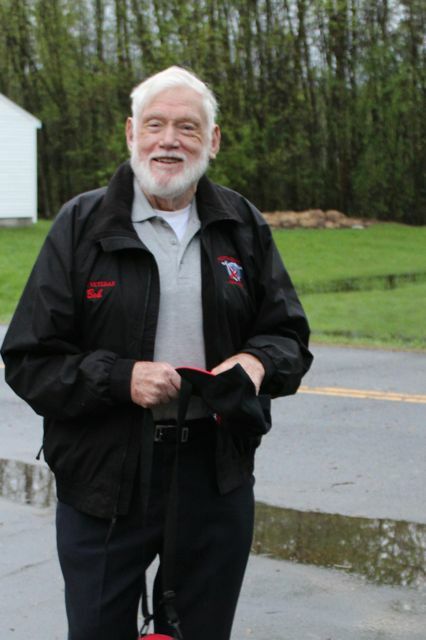 He was outside early this morning, wearing his Honor Flight shirt, his Honor Flight jacket, and his Honor Flight ball cap. And a big grin! And down the road, out here in the middle of nowhere, came three huge motorcycles and the big Jeep. The sheriff of a neighboring county will be Bob’s guardian for the day, committed to making the day easy and perfect. 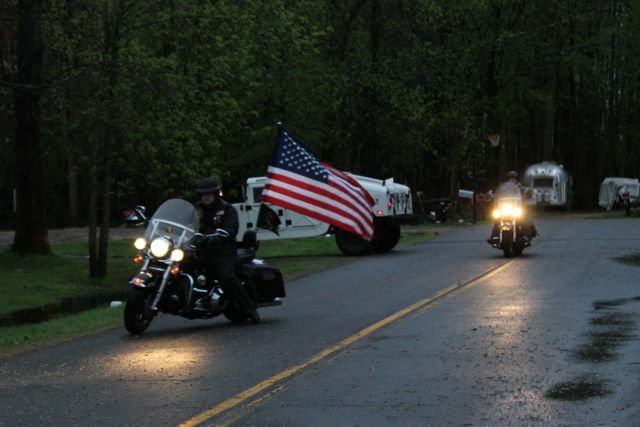 The motorcycle drivers are volunteers, providing the motorcade and the thrill of having a motorcade, because they believe in what they’re doing—they are veterans of combat themselves. They arrived. They stood tall and saluted Bob and said, “Thank you for your service, sir.” Bob’s wife asked him if he had his Kleenex. She and I might’ve needed Kleenex, too. They helped Bob into the car and revved their motors and whisked him off to meet other veterans in town, for ceremonies at the former Plattsburgh Air Force Base. Then they’ll have a ceremony at the airport, before heading to Washington and a ceremony at the World War II Memorial. They’ll be back tonight, returning to a welcoming ceremony at the airport. That’s a lot of ceremonies packed into one day and a lot of happy, exhausted men. Bob hasn’t slept for the last two nights but I bet he will tonight! All Americans sleep more easily because of men like Bob.